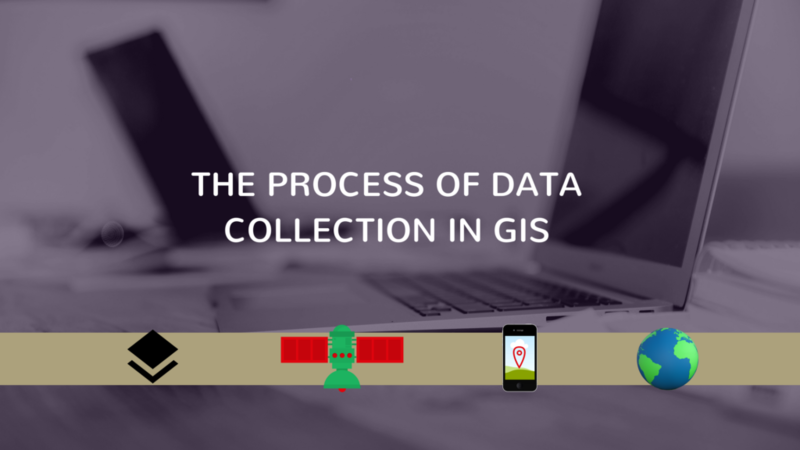 Data collection is subject not only to GIS but is a wide process regardless of the field of study. However, while GIS is growing up, the process of data collection becomes more and more demanding and has been evolved into a sub-category of science with methods targeted at collecting data for GIS. Data collection includes other sub-categories such as data capturing, and at this point, it would be useful to point out their difference. 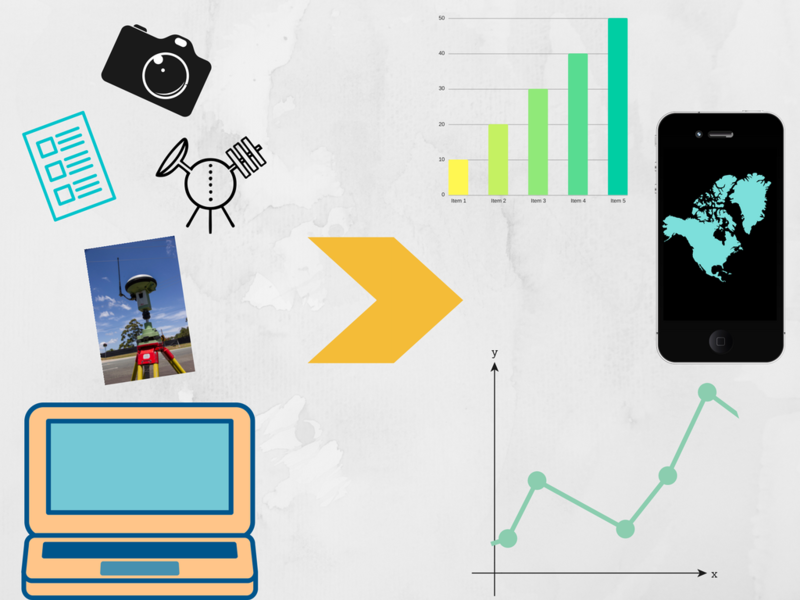 Data capturing is most assigned in digitizing the data when entering the GIS system, while data collection is a process referred to the sources and information we gather, aimed at specific parameters, in order to insert them in GIS and create. Other sub-categories of data collection are data sampling and data transfer. It is widely known that GIS is a very useful tool, it can be combined with almost every field of study and place information on the map so that to draw conclusions effortlessly. Below we will see what kind of data we can find during data collection and the methods we use to find them. Becomes easily perceived that for the data collection process we need firstly data and information to create the base map and then information about the layers which are going to overlap the map. Therefore, the data needed for the base map belong in a category named “primary sources” because these spatial and location data are received for direct use in GIS in digital format. 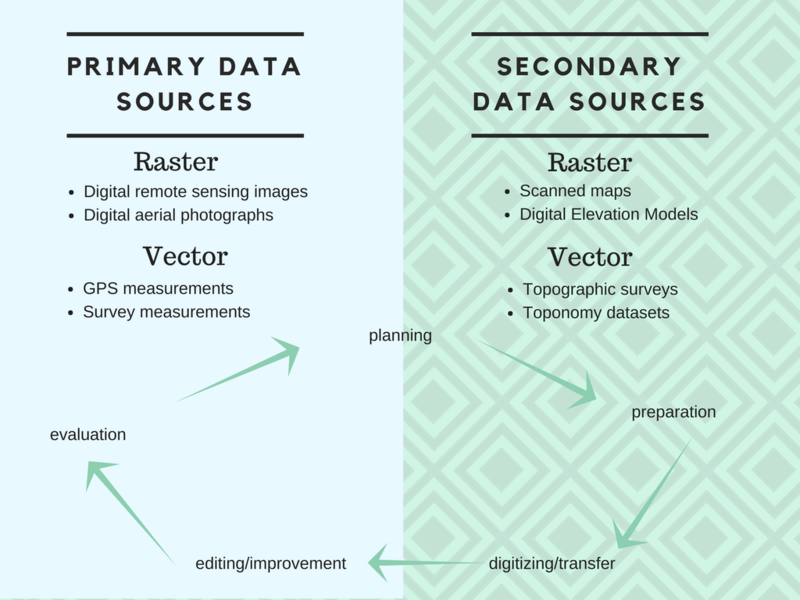 The other category of data is called “secondary sources” and refers to data of general interest gathered for any reason which can further be used in GIS after appropriate elaboration. Of course, in the second category may belong also paper maps and other spatial data which are not in a GIS format and they demand digitizing. Moreover, if we use secondary data we have to be very careful and consider if the data are right and when received, otherwise our final result will be wrong and probably outdated. Last but not least, there is a third category which concerns data transfer from the spatial web and online databases. The main methods used for data collection are the same with the methods used in the process of data capturing. These are remote sensing, GPS, photogrammetry etc. Below we will see some other methods and applications a bit more specialized, for data collection. It is the most holistic approach to data collection. Data are gathered either from on-site surveys or from remote sensing, photogrammetry and GPS techniques and through their combination we have primary data collection which results in scientific maps and research. It is an illustration of the earth in 3D and high-resolution configuration. Its advantage in data collection is that we don’t have to figure out with distortion and the user has the ability to scale up and down, set it up in mobile or desktop and easily share files and documents etc. Moreover, digital globe provides interactive maps with many capabilities and a variety of topics to overlay the globe. A new application through which, every single person with a smartphone, can share spatial data and upgrade the information we have for any place. This happens through social media sites. For example, when the user takes a picture, there is an automated question which asks the user, “where is that photo taken?”. The user then can answer this question and improve the geodata. In this way, there is a bidirectional help because we can share, as well as collect data. One more application based on smartphones and the users. The manipulator allows the device to find his location on the map and if this location is mistaken the user can interfere and put the right location. Some years ago, this process was inaccurate but while the users help by giving data, it becomes nowadays better so that to collect the right and upgraded data. It is one more source where we can find and collect data from. Interactive maps on the web, represent the globe and gather data about locations and touristic content information such as hotels, restaurants, coffee shops etc. These data can be collected and used either for a base map (from the global data) or for the above layers which overlap the map (from all the other data of the geovisualisation). – Digital imaging which substitutes the classic image of photogrammetry for a better depiction of the area hence better data collection. – Laser scanners and SAR (Specific Absorption Rate) which allow the easier illustration of areas like forests when it is difficult to illustrate them in other ways. – Cameras equipped with geographic information system technologies for immediate, automated and directly digitized results, mainly about resource potentials. – Stereo images from high resolution and close-range photogrammetry with orthophotos, digital surface model etc. Through the above-listed processes, we have more specialized and scientific data collection., Either we want to create a story map with the restaurants in our area or a map with the surface runoff, it is obvious that there are plenty of sources for data collection. Of course, the main sources are GPS, remote sensing and photogrammetry but all the mentioned methods and applications are useful too.Stereo images from high resolution and close-range photogrammetry with orthophotos, digital surface model etc. With years of experience, professional and specialized staff, UIZ company provides information and support to your project in the field of data collection and data capturing for GIS, through remote sensing and photogrammetry. For more information and questions, you can find us in UIZ webpage or call us at +49-30-20679115.